The Ben [No] More 4 from the South...Sare Wan! Despite it being my birthday, I had had, by all accounts, a crap week. A streak of bad luck and stress at home and at work combined with extended hangover symptoms had left me yearning for some peace and inspiration come Friday. 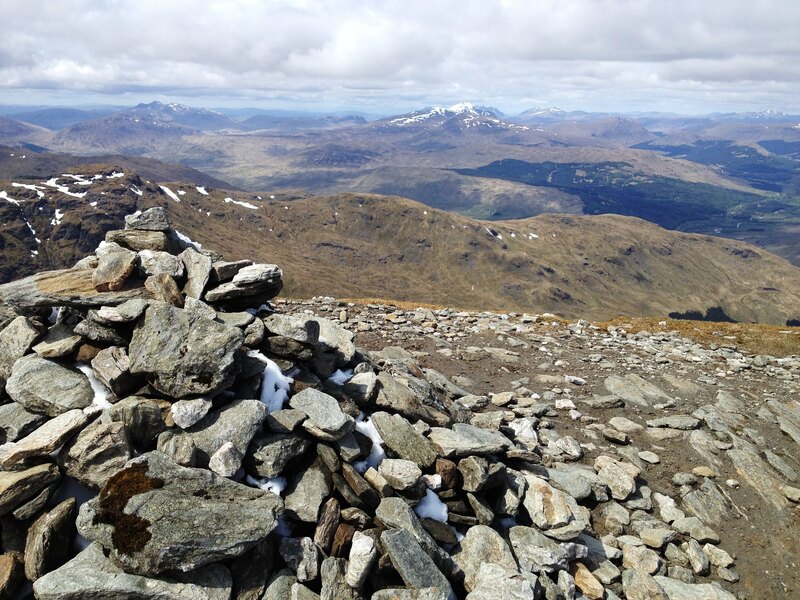 After climbing An Caisteal and Bein a'Chroin from the A82 last week, I had been given a great guide by teaandpies on climbing Cruach Ardrain and Beinn Tulaichean from the same starting point. Given that there seemed to be a nice window of weather on Saturday afternoon, this remained my plan until late Friday night. A combination of Robyn pulling out, and improving forecast (windy and cold, but at least no rain, snow or poor visibility) led me to start thinking about challenging myself a bit more, as I now had the whole day to play with. 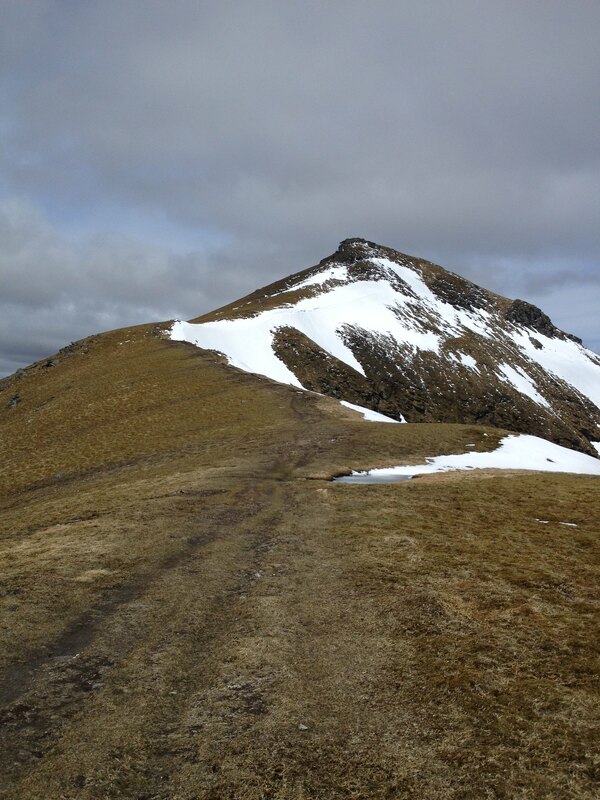 I ended up at RTMcB's excellent report of 'The Ben More 4' from Inverlochlarig from a couple of years ago - http://www.walkhighlands.co.uk/Forum/viewtopic.php?f=9&t=33804 - such a route meant I could do Stob Binnein and Ben More, then if I still felt up for it (unlikely I fancied, given the previous writer's struggles), going on to Cruach Ardrain and Beinn Tulaichean. Ambitious: yes. Retrospectively: arrogant and stupid. 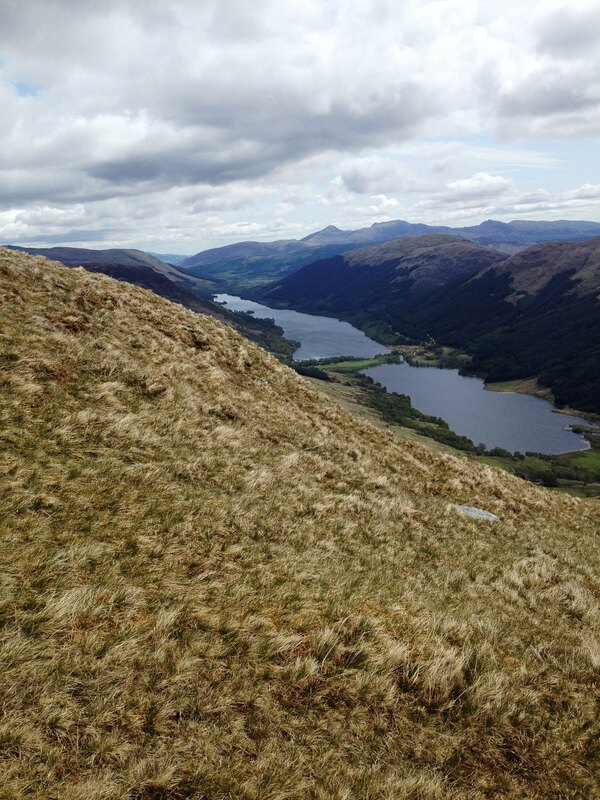 Before I knew what I was getting myself in for I was driving past Loch Lubnaig the next morning. 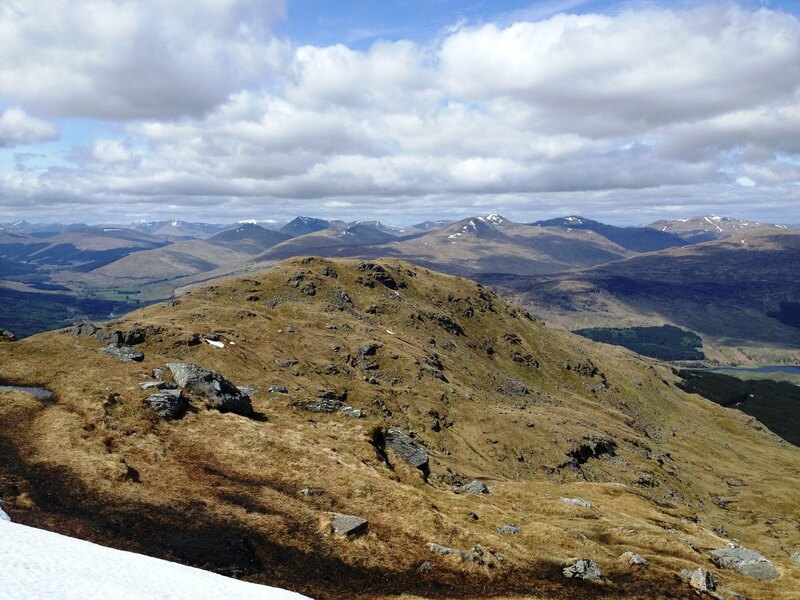 Just last week I had said that doing the Crianlarich 7 in a day was frankly insane, and here I was trying to do 4 of them. I should really have called this report: 'I am now more than half as mental as I thought I would never be last week'. Not really that catchy though is it? 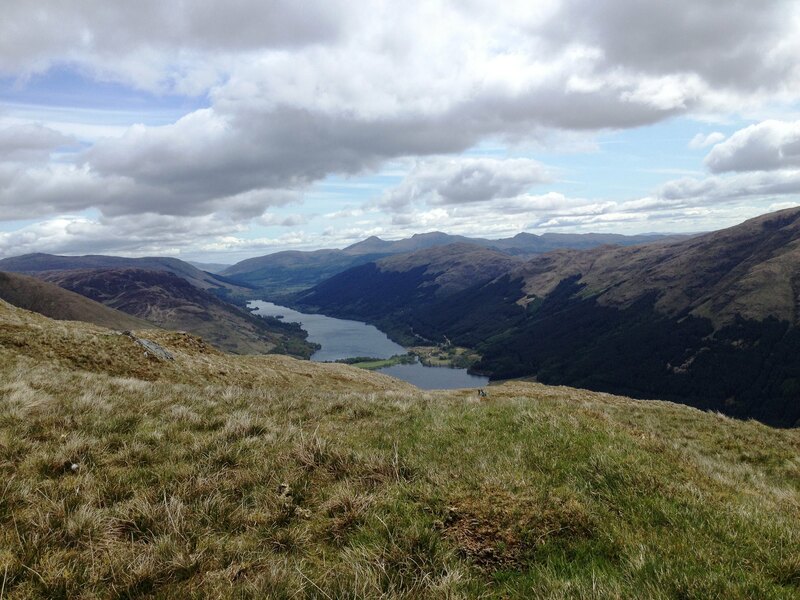 As noted in other reports, the road from Balquhidder past Loch Voil to Inverlochlarig is horrificly narrow with few passing places, meaning a lot of squeaky bum time before you are even on the hills. 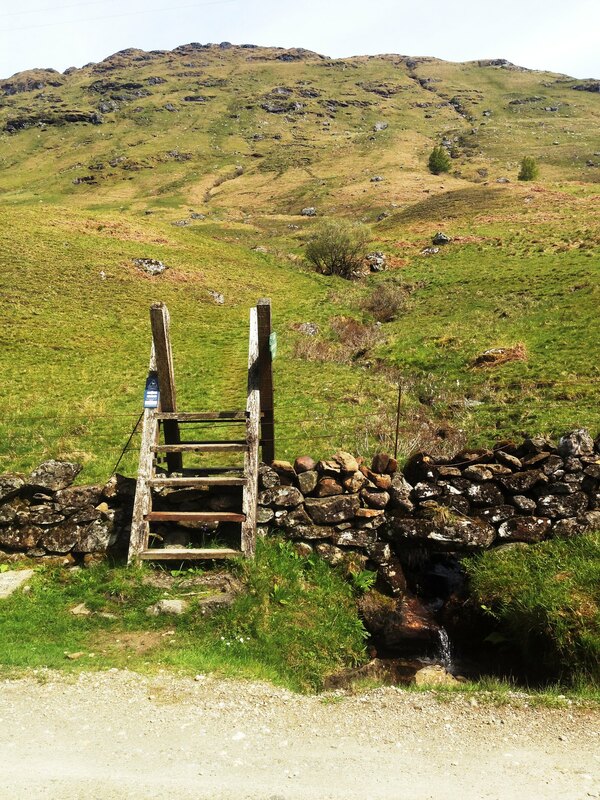 Anyway, by the time I was parked up and readied it was 10.30 on the dot, so crossed the road and over the stile (signposted to Ben More) to start ascending. 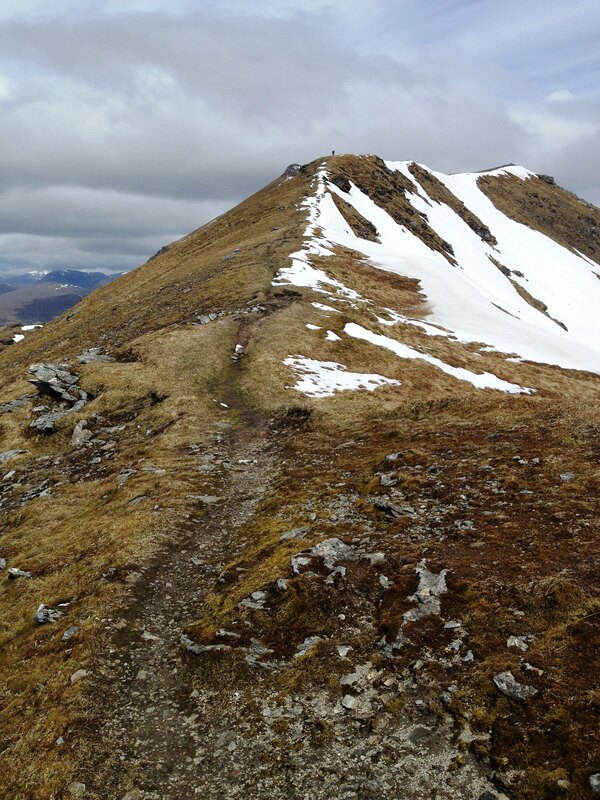 A pretty steep and unrelenting ascent to Stob Invercarnaig on a well-worn path, rewarded by views back to Stob Breac, Stob a'Choin and Loch Voil. The weather was pretty warm this low down. Passed a few people, had to stop for fluid several times. 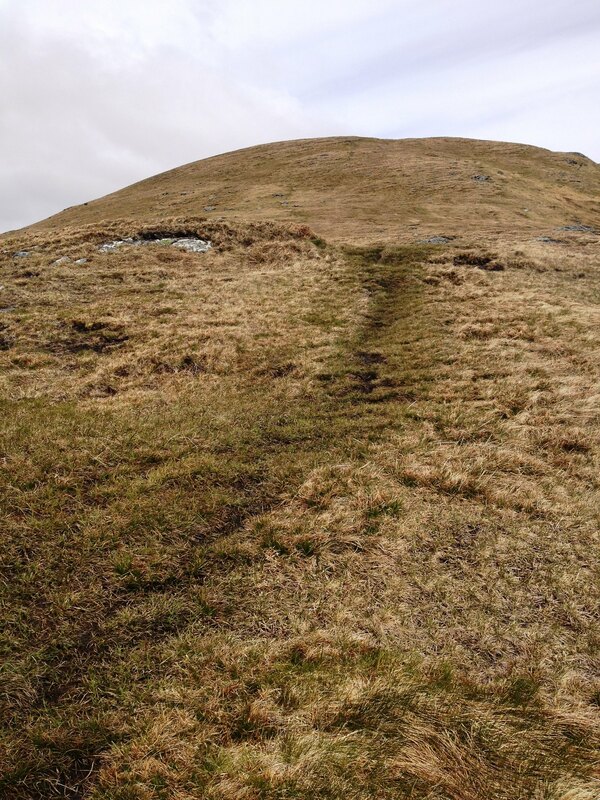 Once over the first precipice, there is a bit of a boring slog over a bulky flank for a couple of kilometres to reach the more narrow and rocky, and quite beautiful, ridge of Na Staidhrichean (which I am translating as 'the stairway' whether right or not). Here, it was extremely cold and windy, and several layers and a face protector were applied! 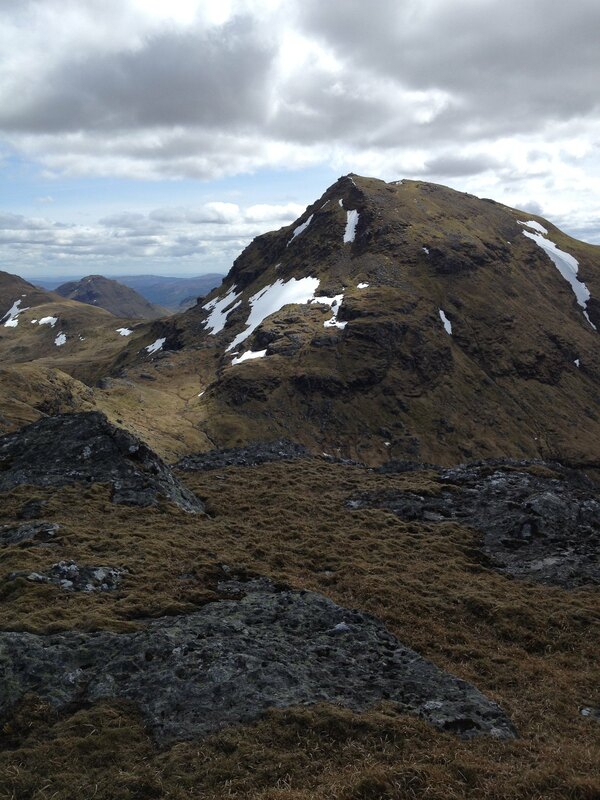 Stob Binnein, the first munro of the day, soon comes into view - and the scale of the day's mission suddenly hit home. I seem to have a massive weakness for looking at things on a map, or in pictures, or even roughly scaling by sight, and grossly underestimating them. More on that later. 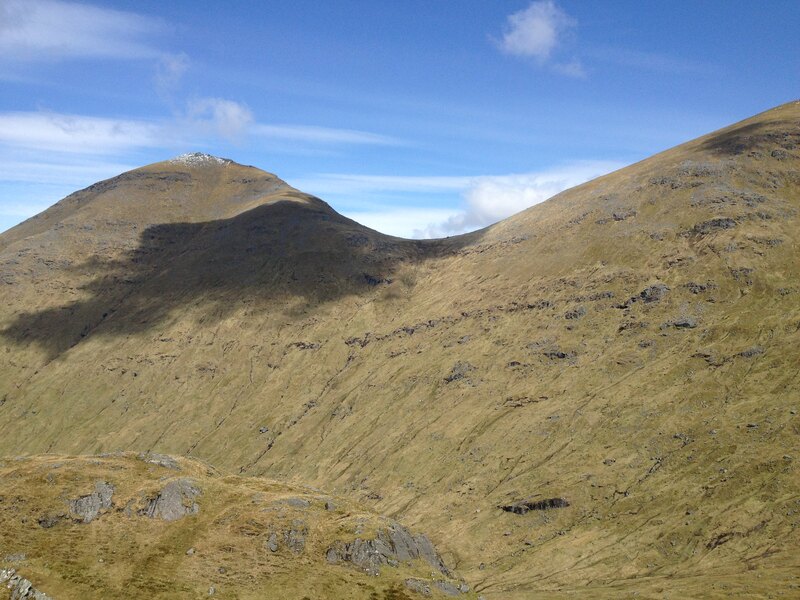 The first objective, however, is Stob Coire an Lochan (on the right in the first pic). 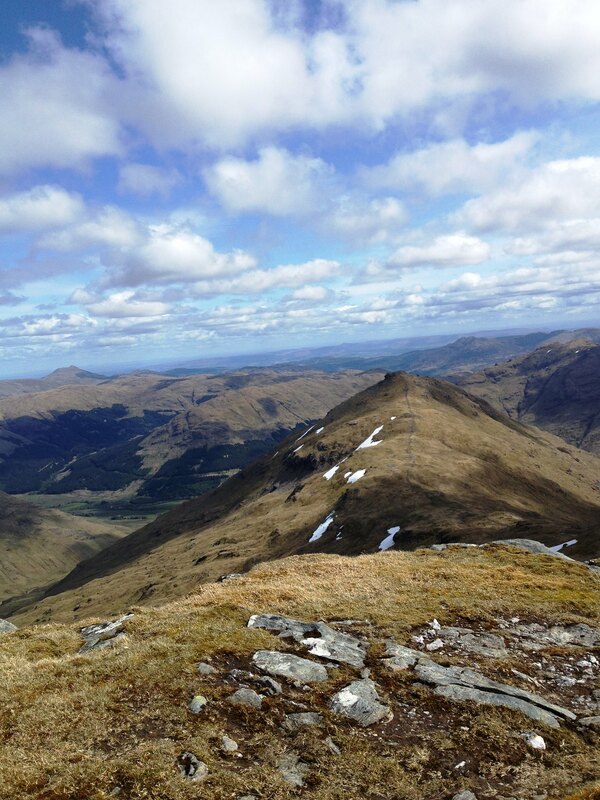 Here, I met a couple of girls who asked me if this was Stob Binnein, to which I had to point north and say 'no, THAT is Stob Binnein' (they thought 'that' was Ben More - I felt their pain). 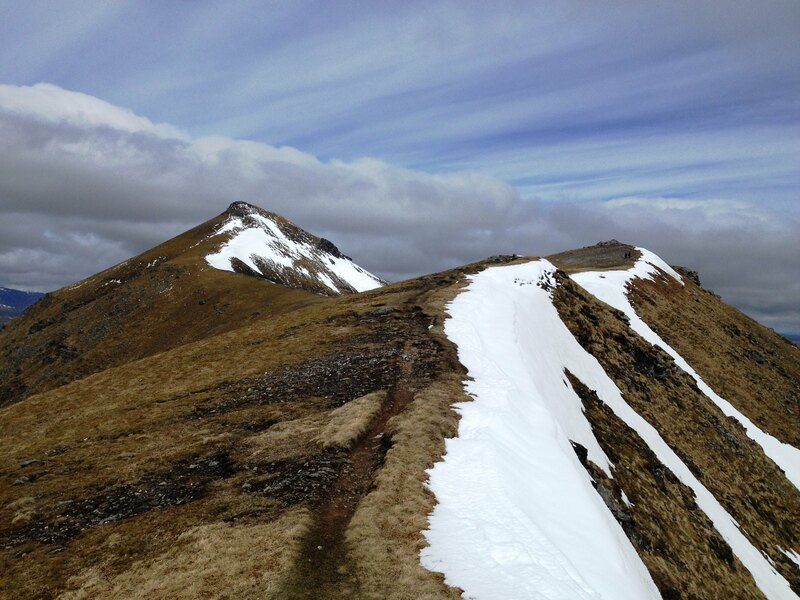 Said I would see them at the top, then onwards, with strengthening wind and increasing steepness, to Stob Binnein. Had a quick bite at the top. 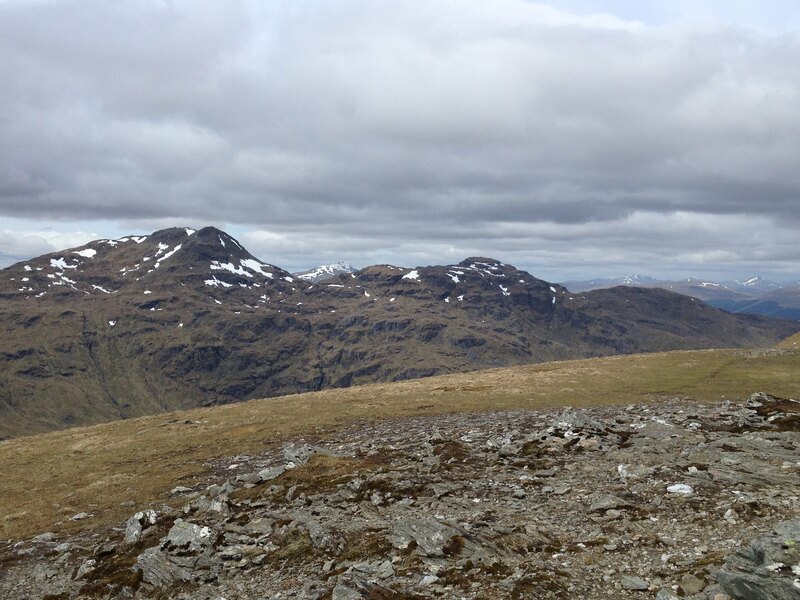 Tried to spur the girls on when they caught up to go across to Ben More too ('might as well', 'only a quick jaunt'), but they seemed as unsure as I was beginning to feel. 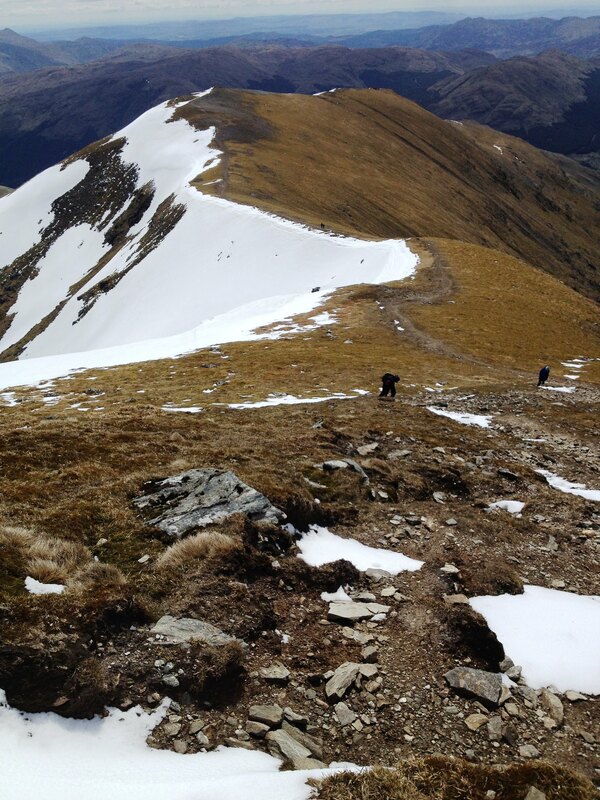 Having never done the Benmore Farm route, I had only seen these 2 in pictures, but in reality they are far more impressive. 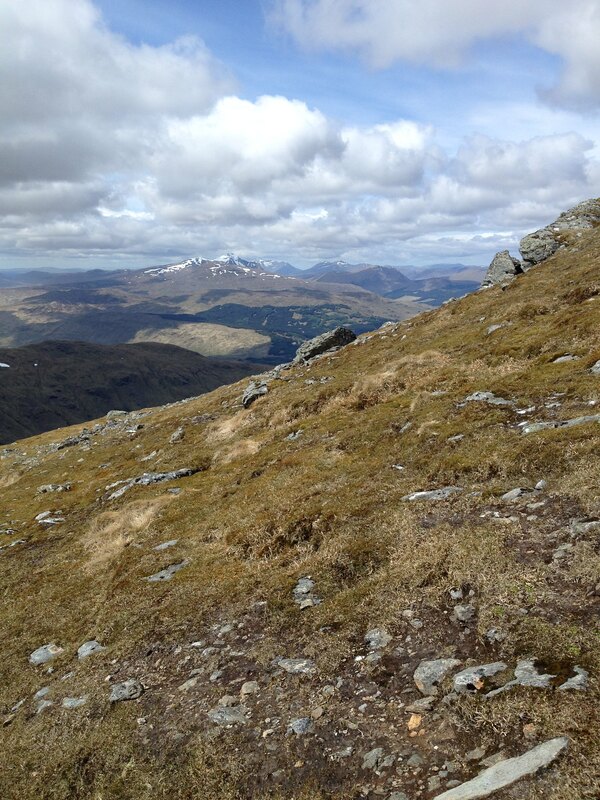 From the bealach, both look truly immense! 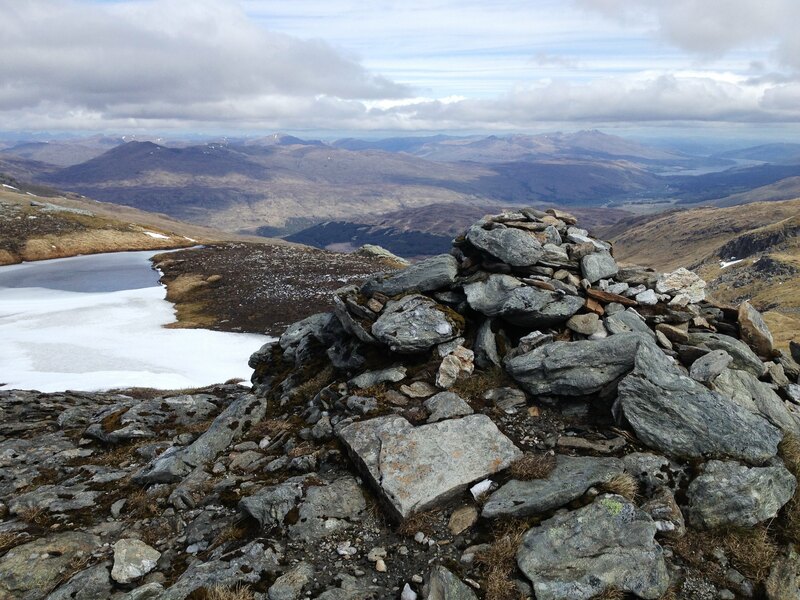 The ascent up to Ben More is rocky and steep, but enjoyable, with some nice shiny rocks to be seen! 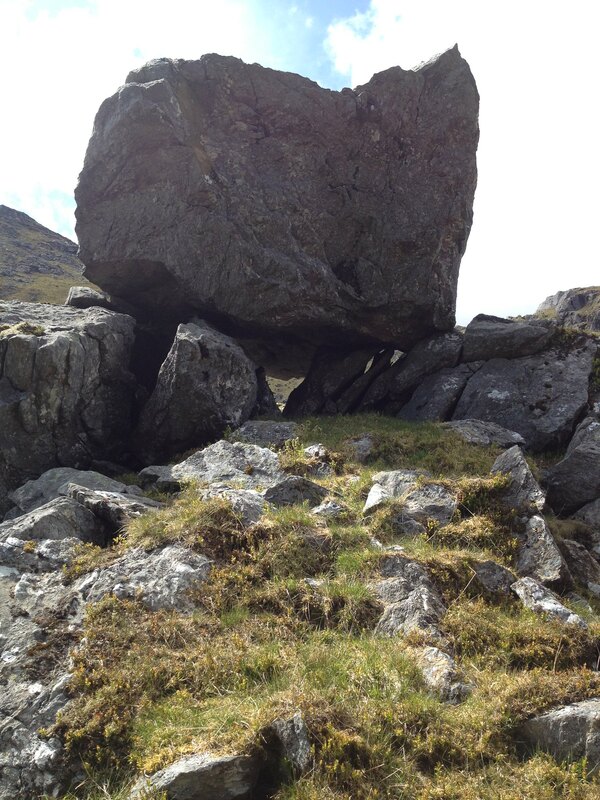 There is a bit of avoidable scrambling at the top, which for me resulted in a twinge in my hamstring - I should have seen this as a sign (one of many on the day), but I did not. 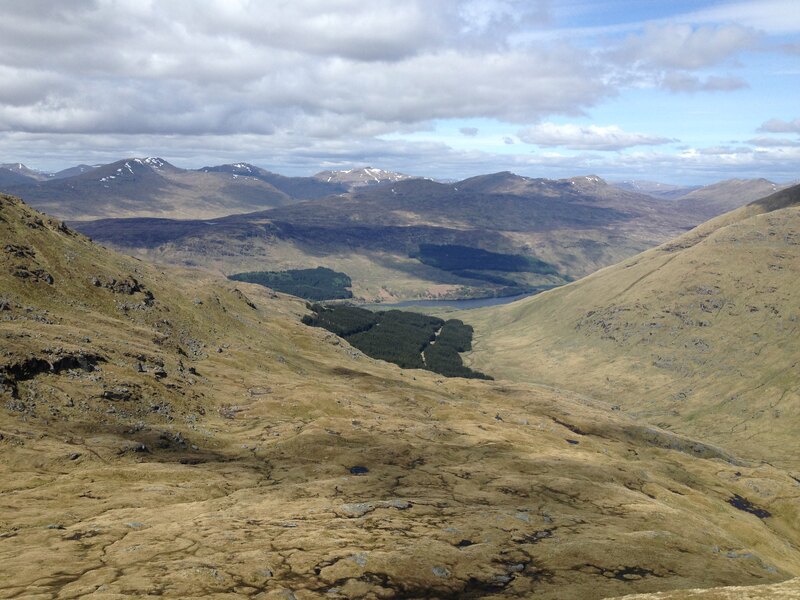 The views, as most people reading this will know, are amazing in all directions. 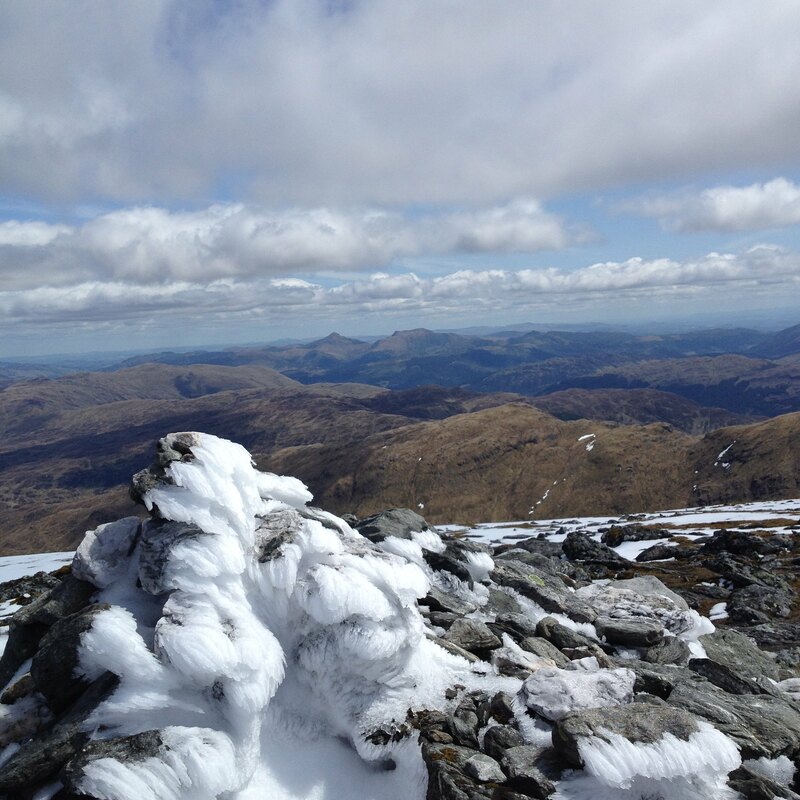 The summit here was busy with other walkers, and there was quite a bit of snow and ice left from the flurries throughout the week. I sat and had lunch here and pondered the options. It had taken me about 3 hours from the car. The previous report I had seen had taken 10 hours - surely I'd be able to get up the other 2 and down for 7 or 8? 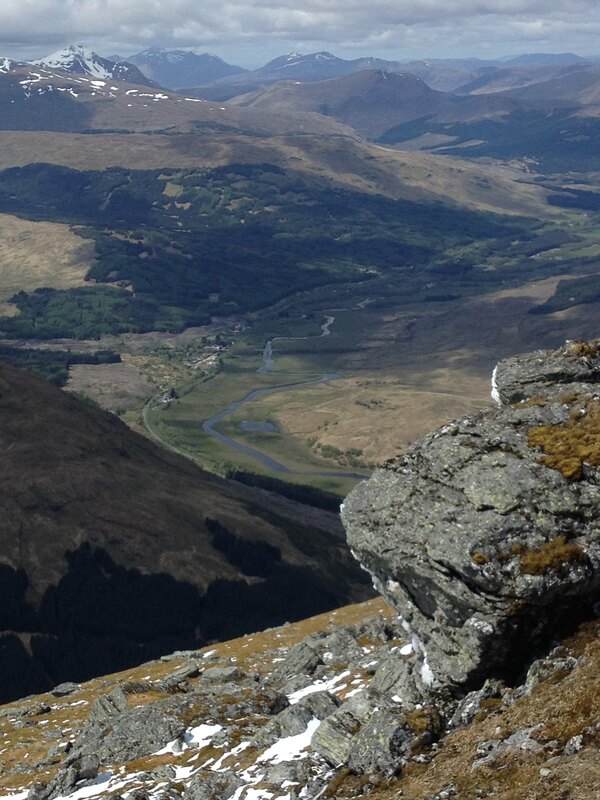 I looked down to the valley. 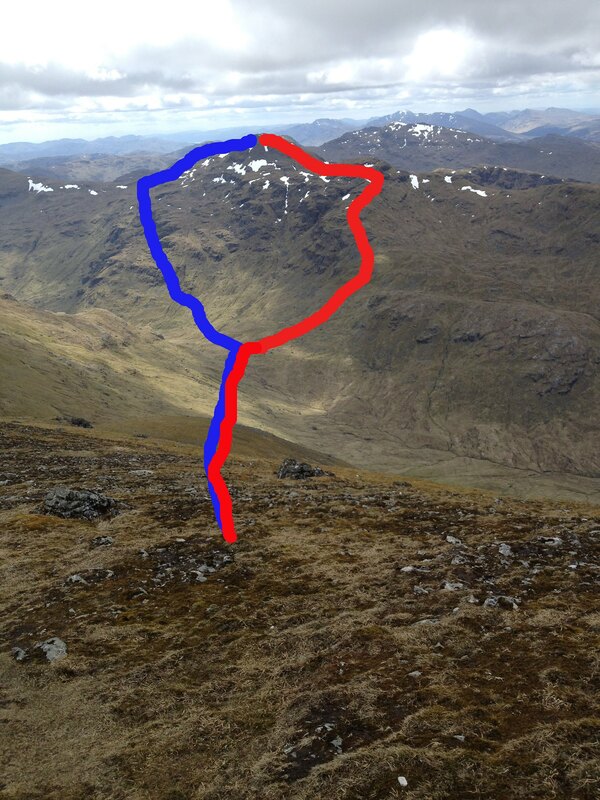 RTMcD's GPS had shown him going along the valley and cutting up diagonally to reach the bealach between Cruach and Beinn Tuliachean, then walking up the path to the summit (see blue route, below). 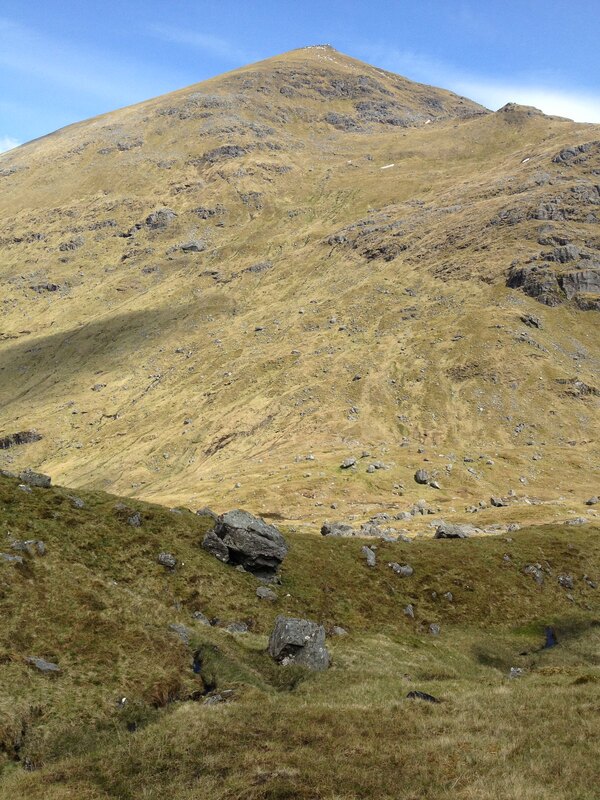 The way I saw it (red route), if I could get down to the top of the valley, I could climb straight to the right up the steep slopes to gain the ridge, then up to Stob Garbh, and it would be plain sailing from there.....surely??? This would allow for the least amount of ascent and distance. 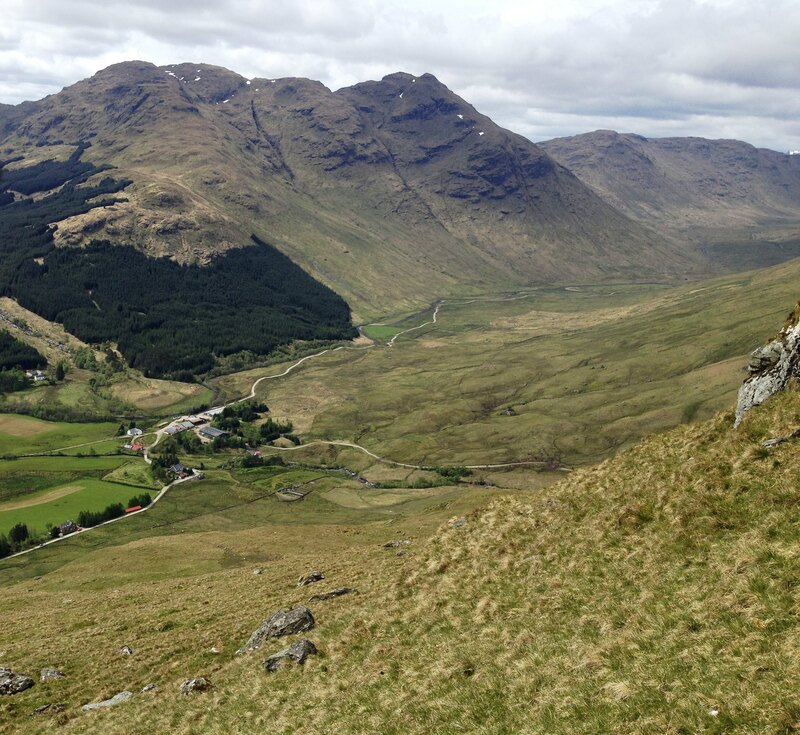 I decided I would get to the top of the valley, then decide whether to start ascending, or else follow the valley all the way back to Inverlochlarig. On the way down, the sun came out and it got a lot warmer, layers were off as he sweat started to pour. 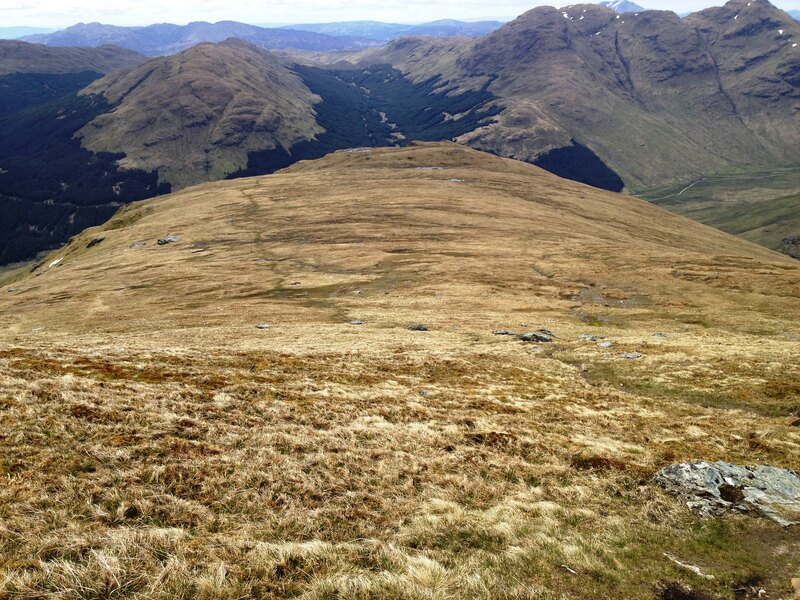 The descent down is pretty awkward and pathless over lumpy, steep and boggy ground in places. 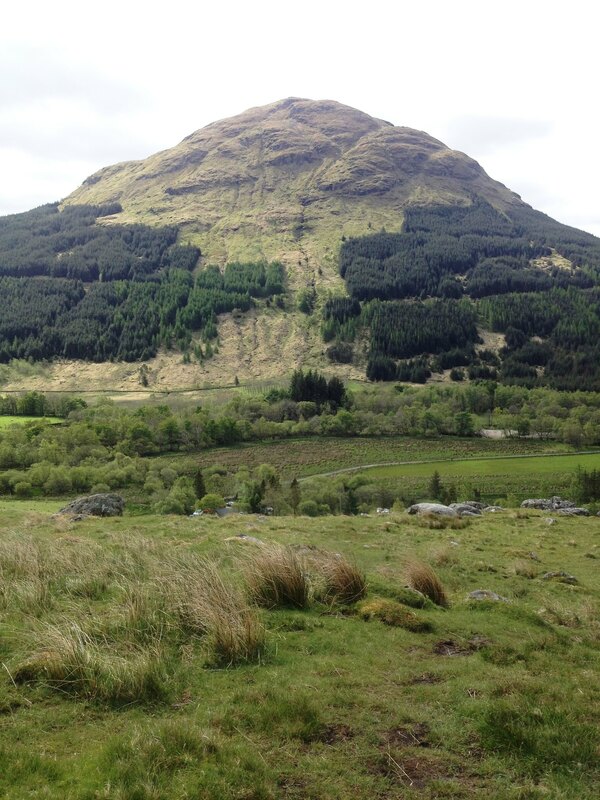 I would probably prefer it to a re-ascent of Binnein though if I was to go back. ...But I had already made up my mind 10 minutes ago. I was going to give it a bash. 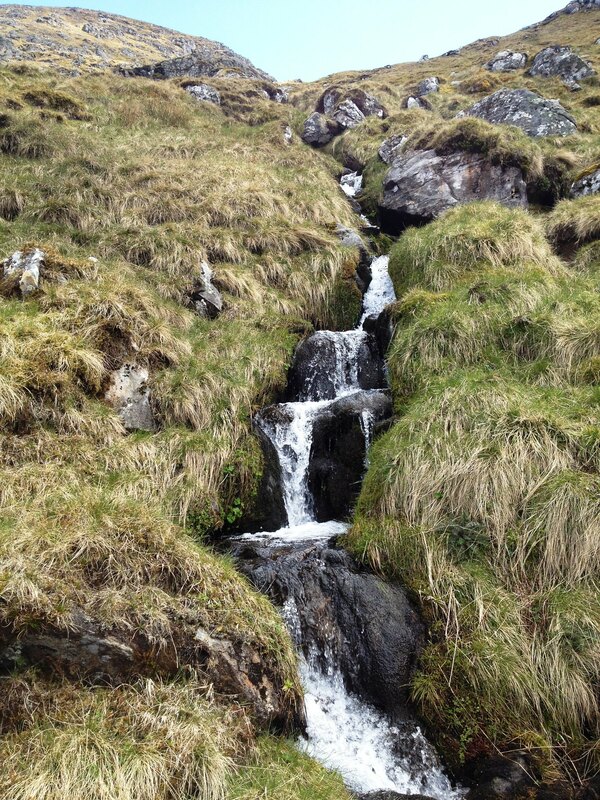 Some more fluid and I was off, aiming directly up to gain the ridge that ran right to left. My body would not thank me for this choice, and an hour later, my mind would be cursing it's own stupidity. Although the views back were great, the heat became a real problem and I had to stop and take on fluid and rest every minute or so. 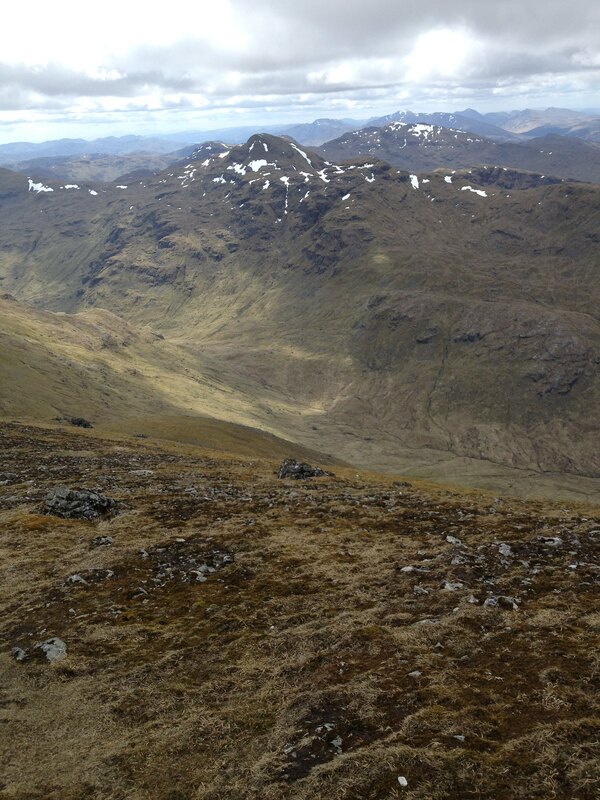 When I reached the ridge, finally, I realised that it wasn't really a ridge, and more of a kind of mini corrie (I forget what the geographical term is), and so the best line of attack here was to bear left and just climb the really steep slopes towards Stob Garbh. I cannot reiterate to you here how knackering and (seemingly) unending this was! My left knee had cramped up and I was definitely regretting my decision, but no way was I turning back - not far to go after all. Or was it? 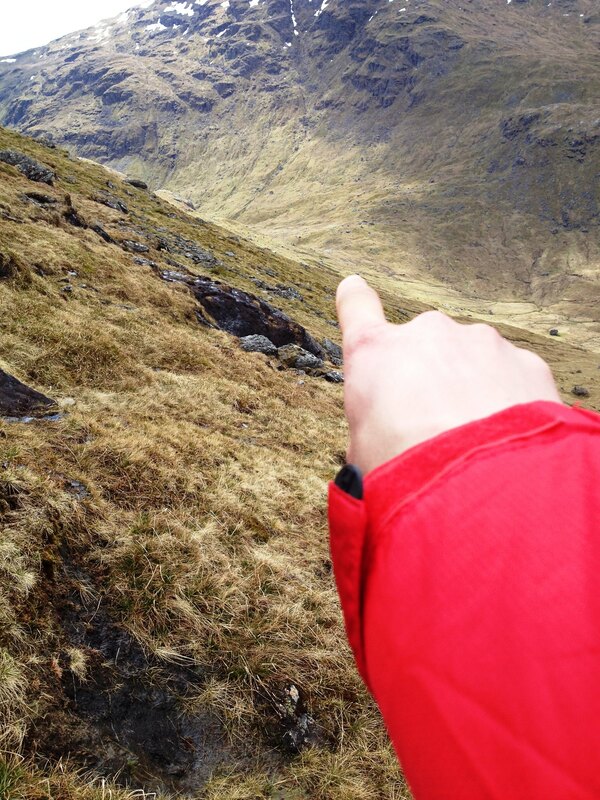 If I had bothered to look properly at a map, I would have seen that there is at least 100m of what could have been avoidable descent from here before a steep pull up of 200m to Cruach Ardrain. 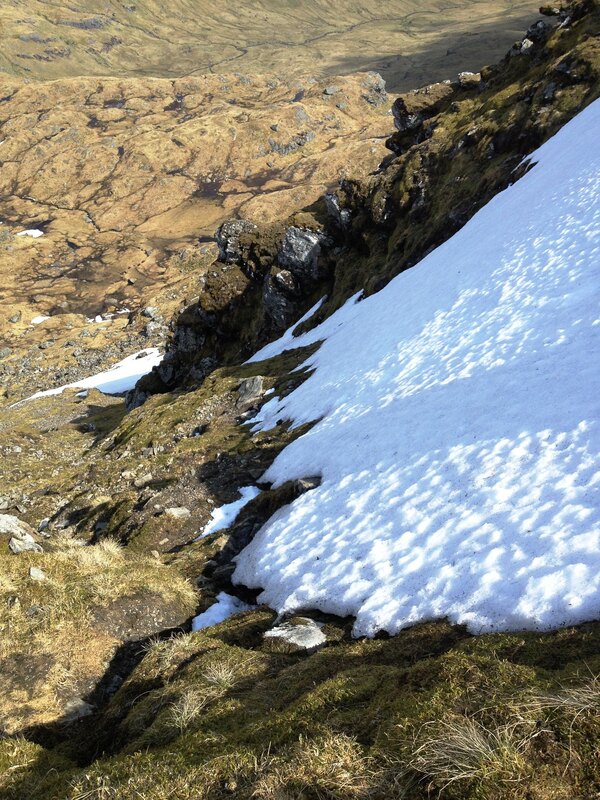 Further to that, there seemed no way there could possibly be a path up, never mind the snow patches! ...but there was! 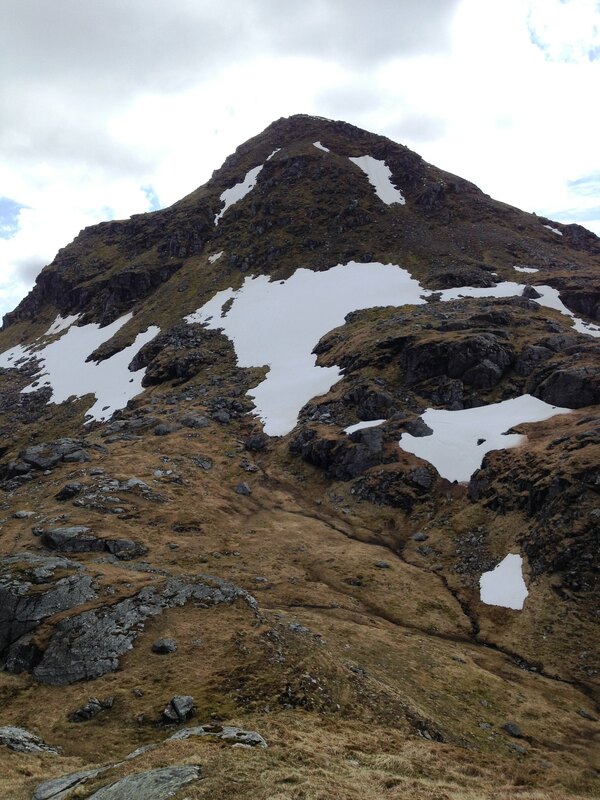 I picked up a path from Stob Garbh, which bizzarely led to the bottom of Cruach and started steeply (and I mean near-vertically) climbing. 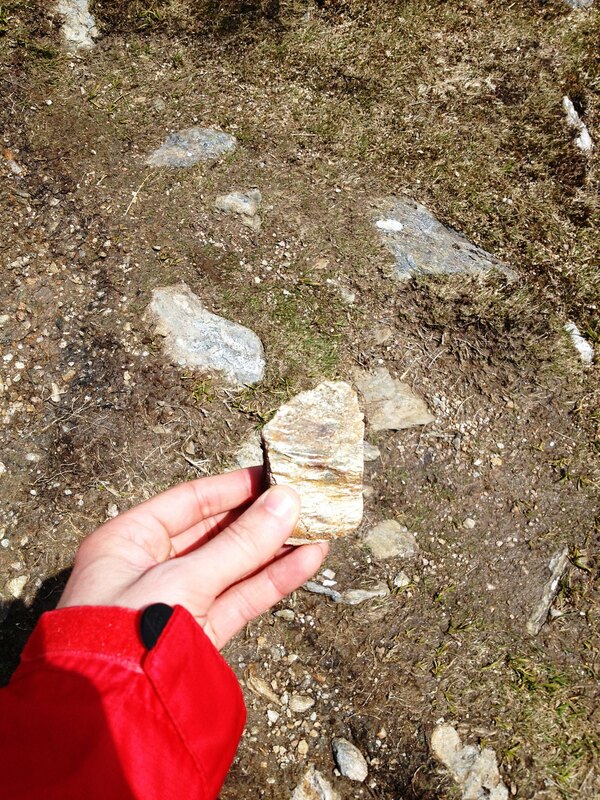 This was sore on the knees, but fine until I got to the snow patches, where the path disappeared. I was hand and knees for (what seemed like) long, shaky periods, almost convincing myself several times I should turn back and there was no way up. As there was nobody else there, I probably should have, as one slip could have been fatal. 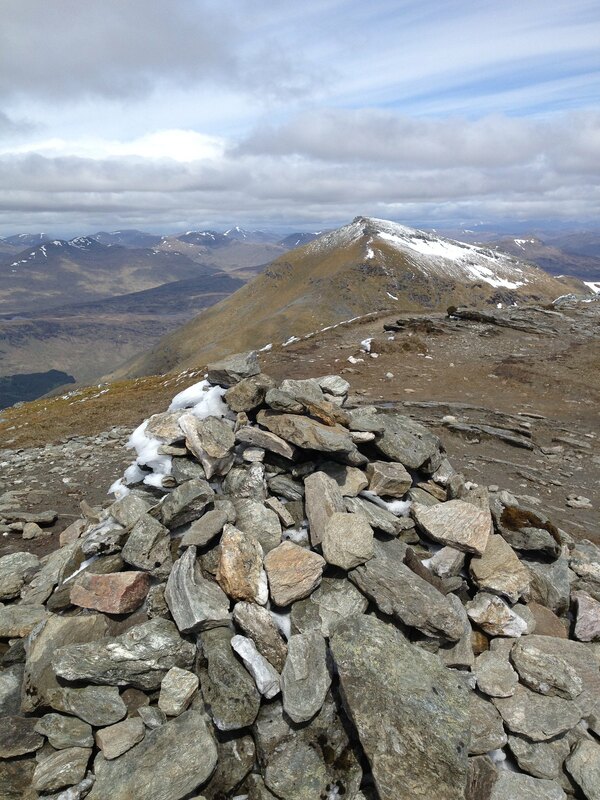 But, finally, I made it to the deserted summit. I had found my limit! 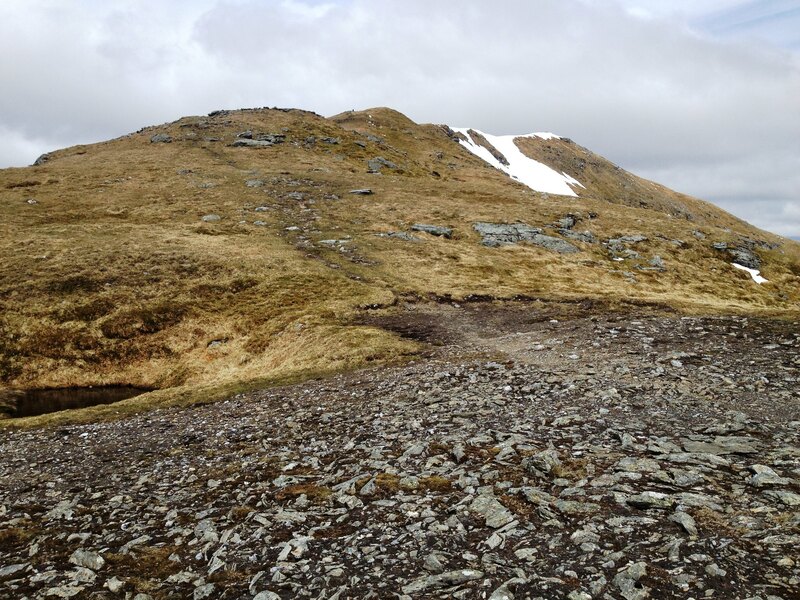 It had taken me about 5 hours to this point, and to be honest I hadn't enjoyed the scrambling up to Cruach, it was out of my comfort zone. All I wanted now was to get off the hill and home! 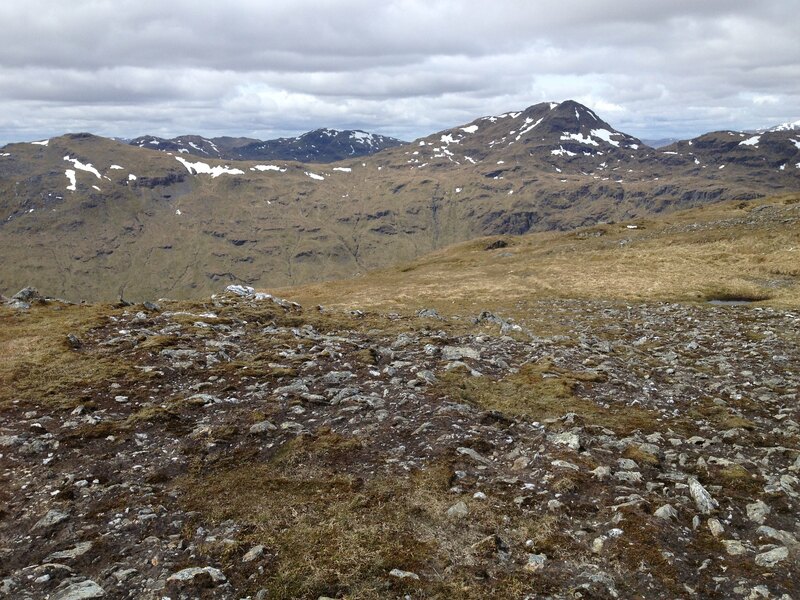 So a quick picture and I started across the ridge to Beinn Tulaichean. All downhill (kinda) from here. Looking back towards Stob Garbh, my schoolboy error was so obvious, but from Ben More, you would be forgiven for thinking they were linked. Lesson learned - look at maps in detail! 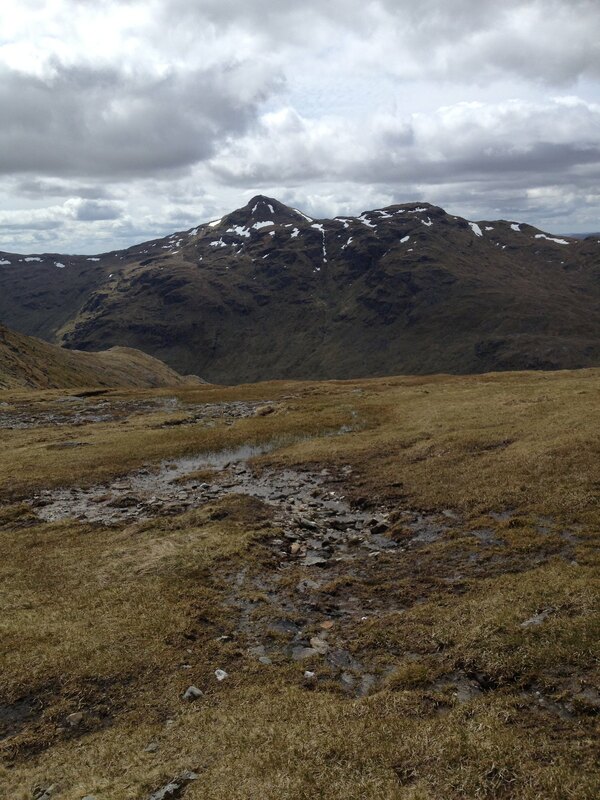 The ascent up to Tulaichean is fairly easy, although my hips, feet, ankles, calves and thighs were feeling every step. Was looking forward to getting down and wasn't bothered about stopping. I HAD 20% BATTERY LEFT DAMMIT! This fully vindicated my possible new camera buy I had been thinking about. 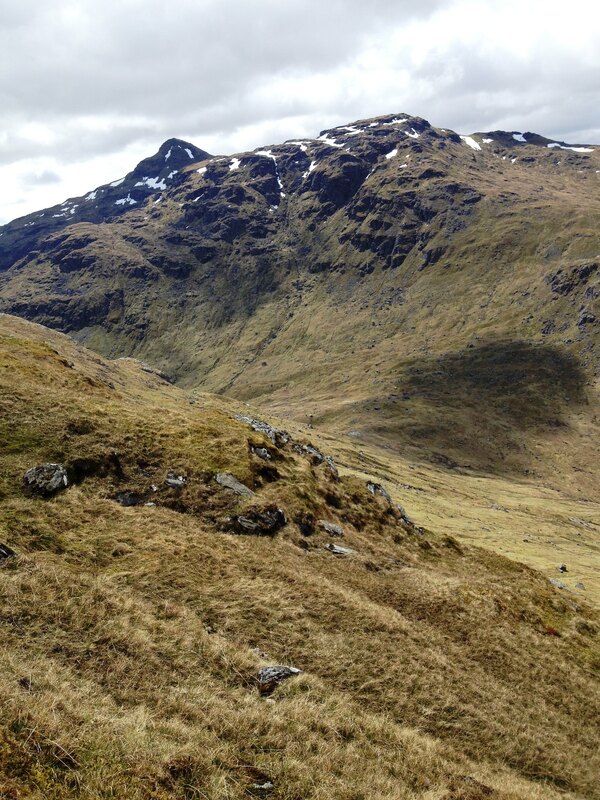 I was in a total huff by this point and so just descended directly down the steep grassy slopes to Inverlochlarig, which took a hell of a lot longer than I had expected. My legs had completely given up trying by now and I slipped on several occasions, frightening the life out of sheep as I did so. Once, finally, at the farm, it's a 10 minute walk along the road to the car park, which I reached at 5pm, 6.5 hours after starting. 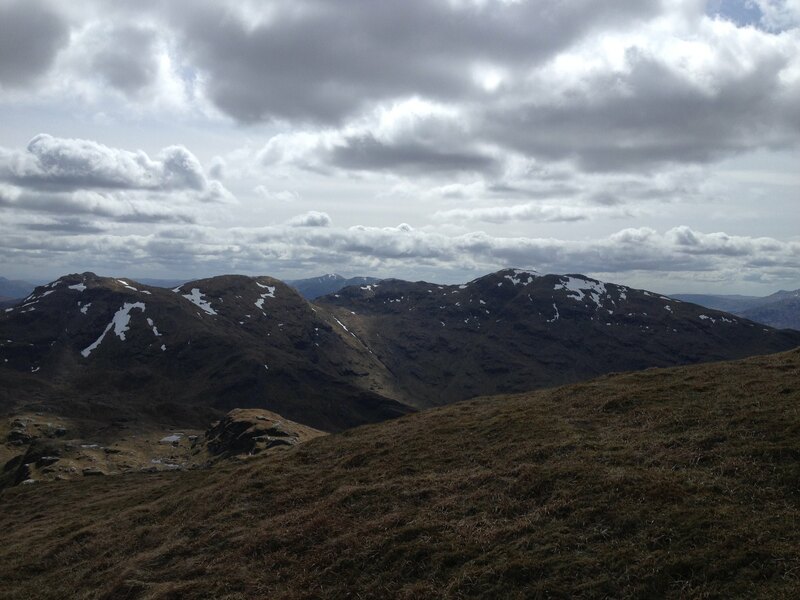 On reflection, I enjoyed the first two munros and, had I picked a different and less demoralising route to Crauch Ardrain, may have enjoyed the other two. Still, it was a good challenge, but one which I am still suffering for and will not be repeating in a hurry! Re: The Ben [No] More 4 from the South...Sare Wan! 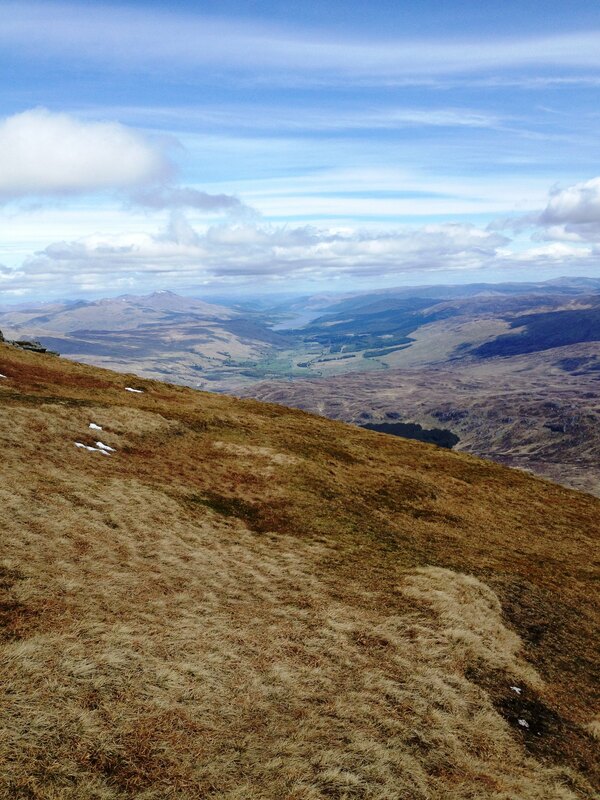 It reminded me, painfully, of the walk I done Bynack More & Cairngorm...silly choices and sticking with it. I wrote a report but my writing skills are pretty poor so if you check it out, I apologise in advance. 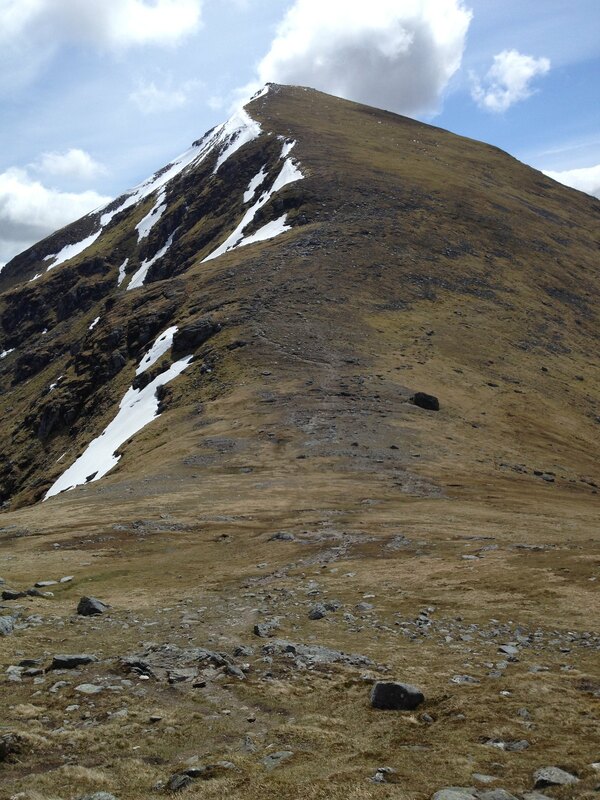 I must admit to being a little frightened of doing Ben More. Feel knackered just reading that! 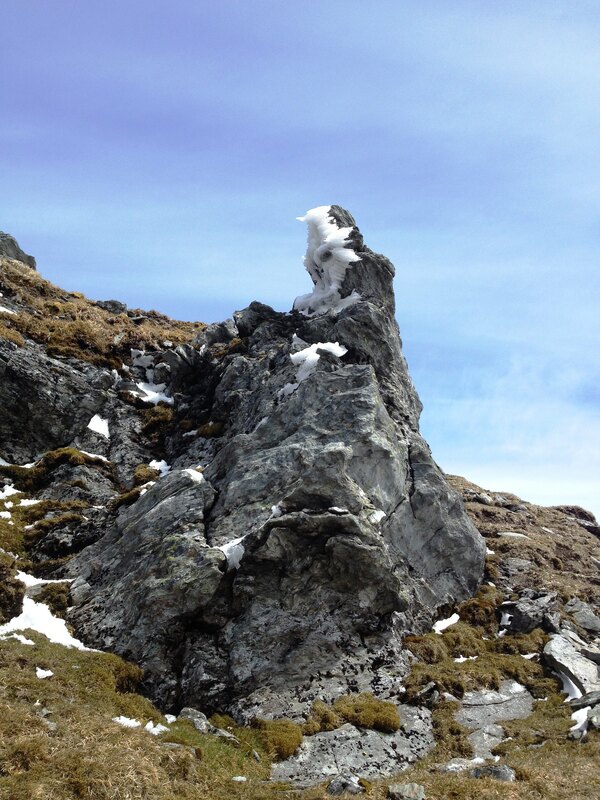 Great report, enjoyed your pictures too! You posted a pretty fast time for all 4 - I've never done them all in a owner but recall Ben More & Stobinnein taking about 6 hours or so on their own. 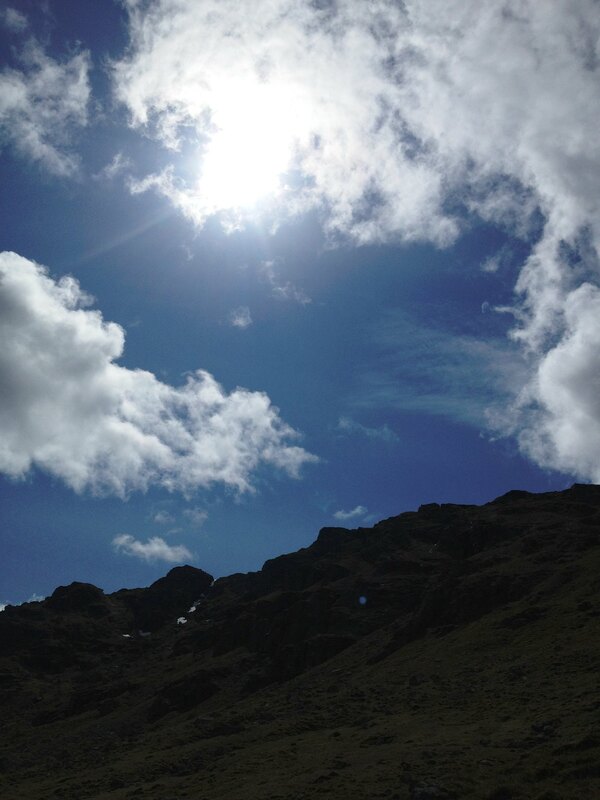 Many years ago I dropped off the col into the same valley, on a dark winters day. 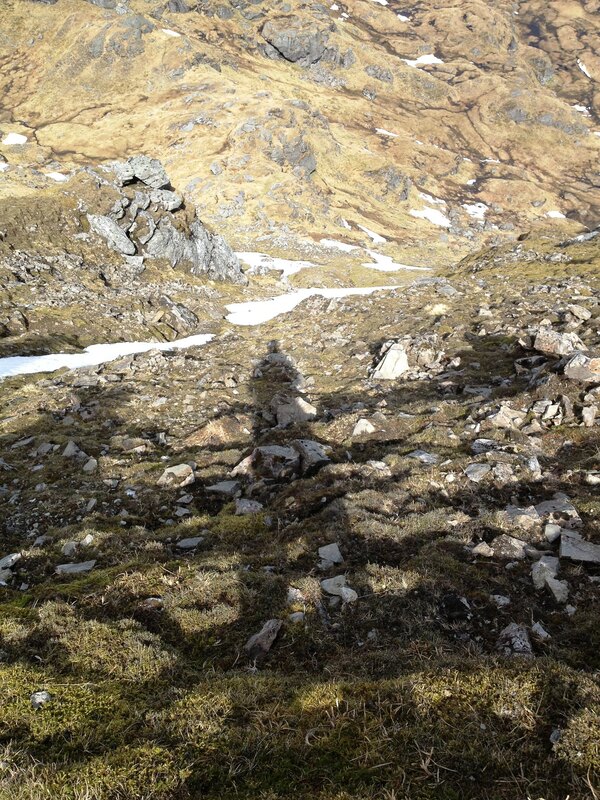 What a brilliantly wild lonely place it is! Well done. 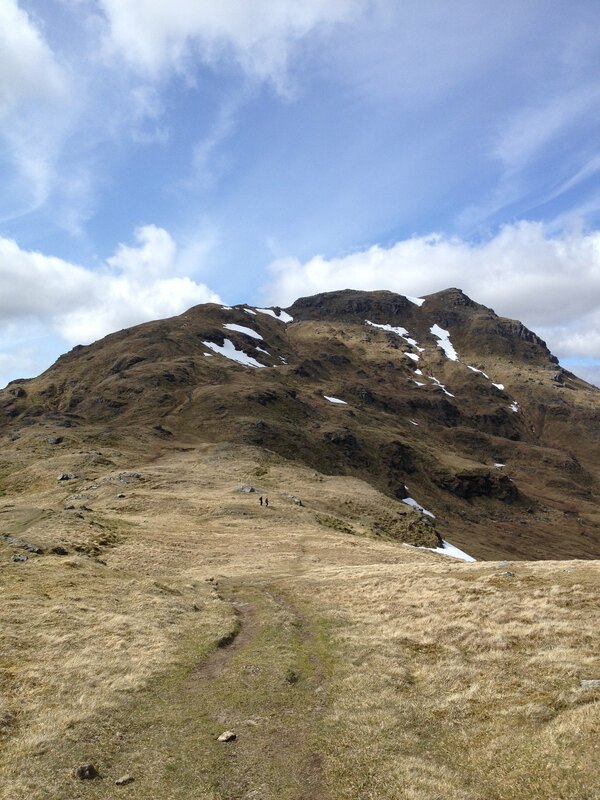 Not sure I'd have enjoyed the 'scramble' up Cruach Ardrain if I was by myself, but as I was not it was great fun. Good report and a pretty fast time. 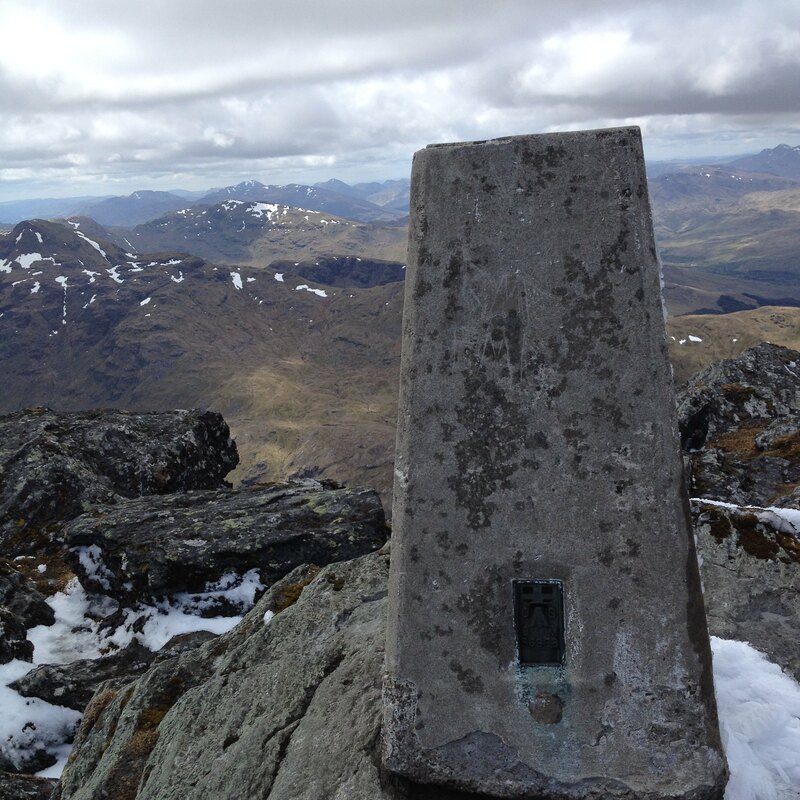 Had a look at your Cairngorms report mate, looked fantastic - some major distance covered and some lovely pics! Don't know what you're on about with your writing - perfectly good! jac the lassie wrote: Feel knackered just reading that! Nice one, good luck to you Jac! 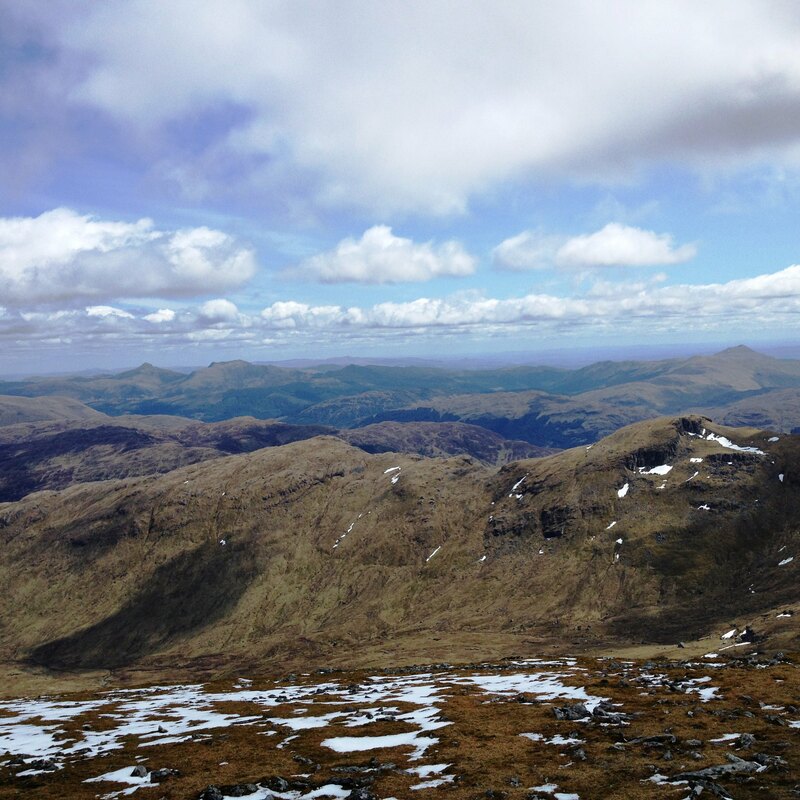 It's a good day, but if I had my time again I would either a) take the 'blue' route to Cruach Ardrain or b) start at the Falloch and finish at Benmore Farm, then taxi/bus/drive back! Think I need to stop moaning now - it's a new week after all! Colin1951 wrote: Great report, enjoyed your pictures too! You posted a pretty fast time for all 4 - I've never done them all in a owner but recall Ben More & Stobinnein taking about 6 hours or so on their own. Cheers Colin! As I've said above, I've never been one for taking my time, especially when I'm on my own.  Probably my downfall half the time. I was a s surprised as anyone given the previous report said 10 hours, but then I realised they went for a nap half way through!!! 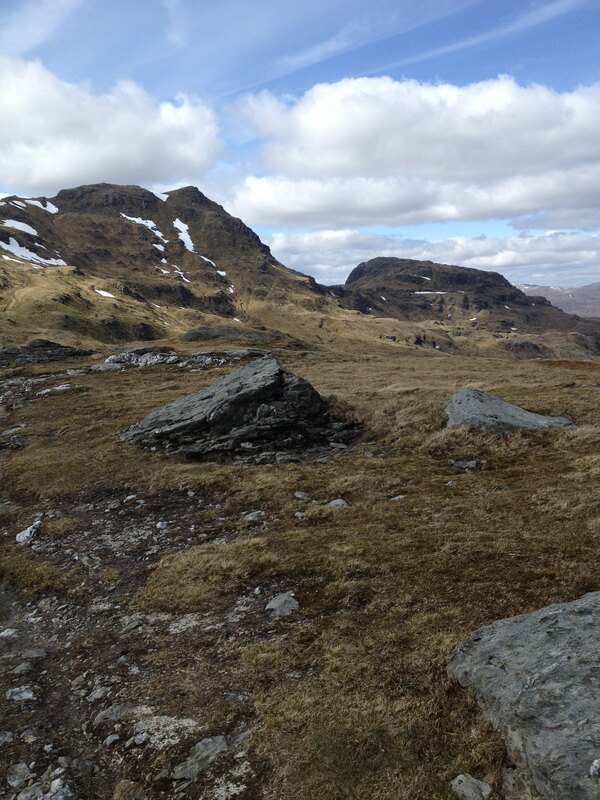 The valley definitely had a feeling of isolation (physical and mental) once I left the two girls behind! Haha, yeah, on purpose?! 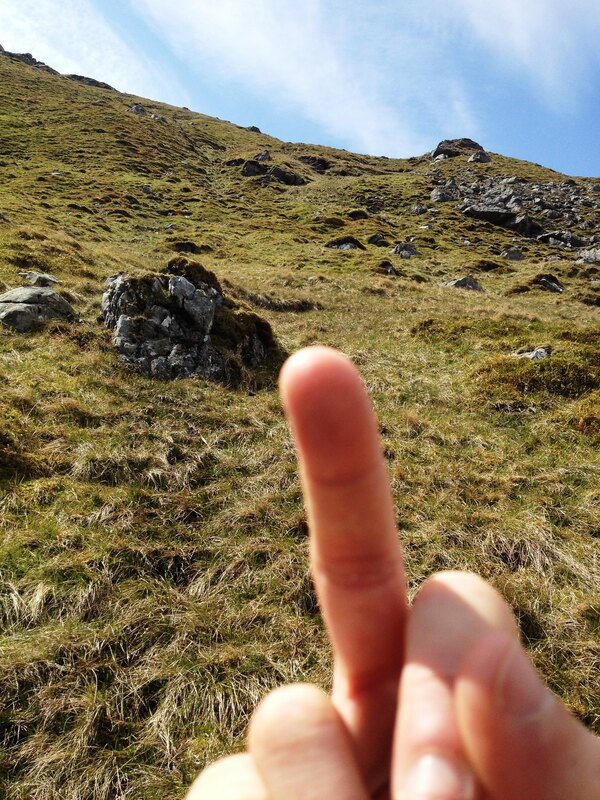 I see you did it the mad way too via Stob Garbh, didn't finish your report though, just leaving it at 'we'll see how we feel at the valley floor'. Definitely a similar experience to myself!! 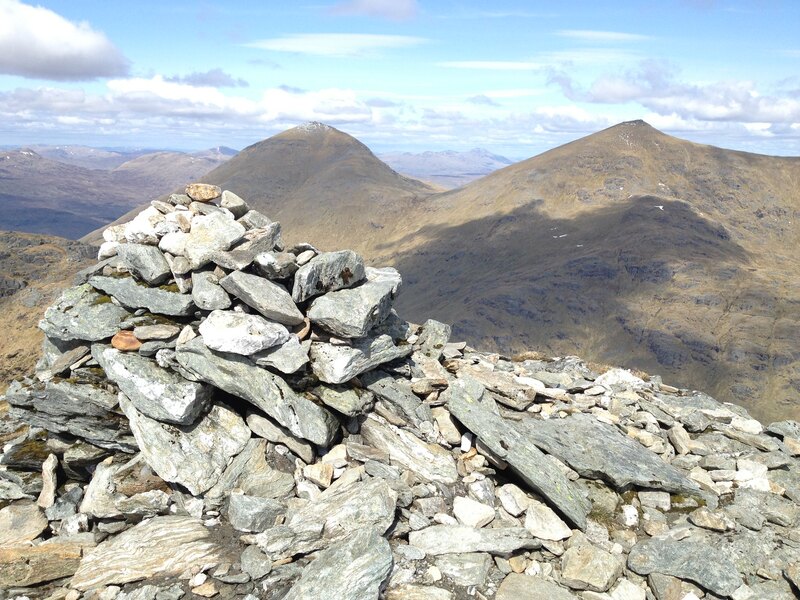 Beinn Chabhair the only one left of the 7 for me now. How was it? 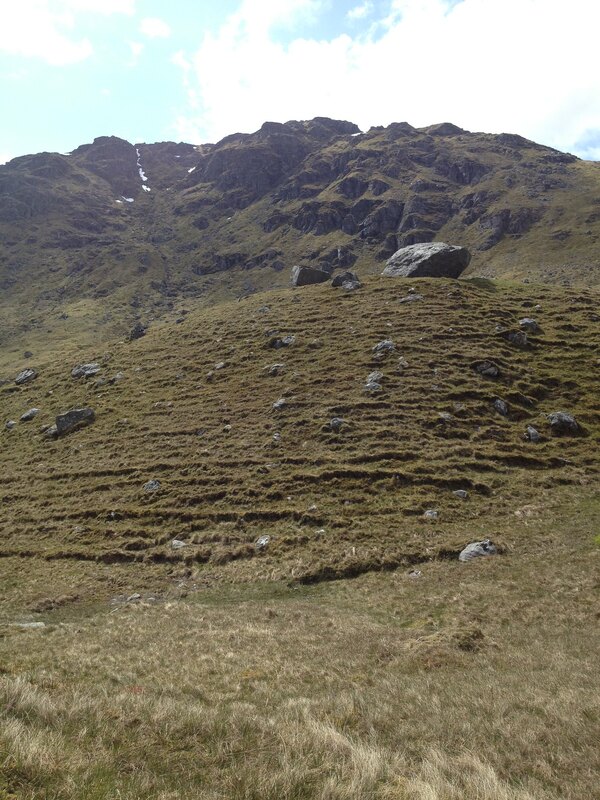 Ok sort of 'on purpose' Knew there was a drop off Stob Garbh (but didn't think it would be quite as big). 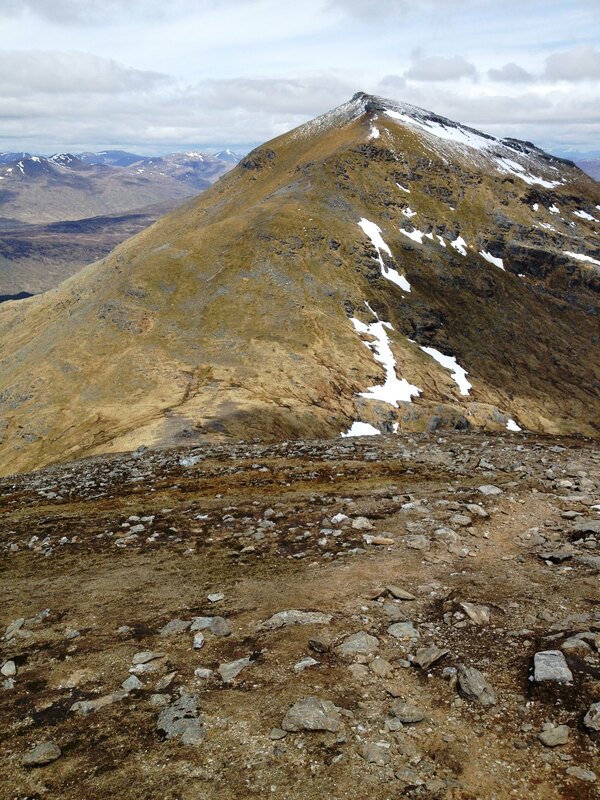 We didn't fancy retracing our steps and by all accounts the more sensible route seemed like a slog and I was pretty tired already, whereas reports suggested there was scrambling to be had going via Stob Garbh. 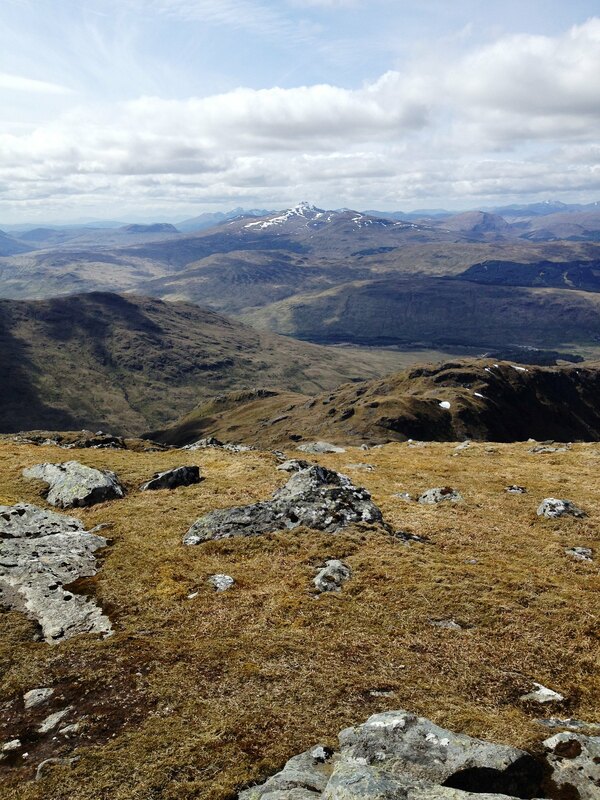 Beinn Chabhair - boggy is the first word that springs to mind. 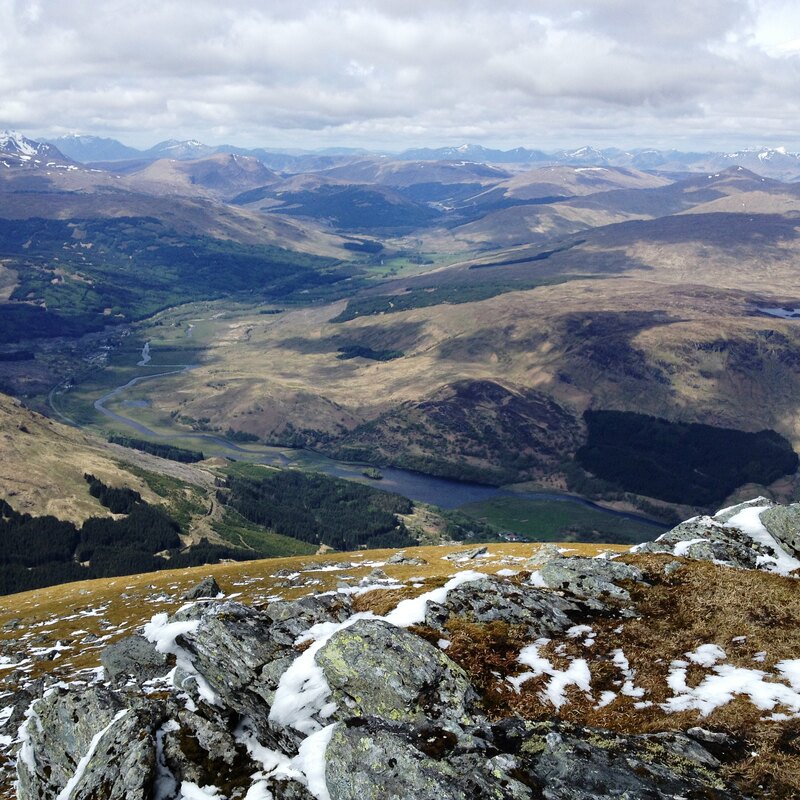 Great hill and views once you get above the lochan though. That was my logic too, although was a bit silly in thinking it would be plain sailing (otherwise that would be a much more popular ascent). 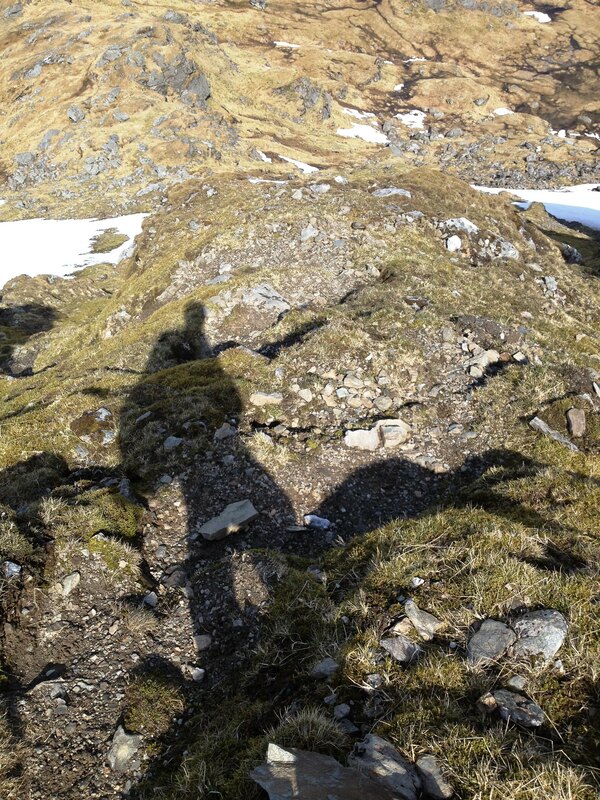 Anyway, think I would have really enjoyed the scrambling were it not for the snow and sare legs! I'll get my gaiters and snorkel looked out for Chabhair!